Saudi Arabia has finally revealed what life after oil may look like. The world's top oil exporter and Middle East power on Monday unveiled an ambitious plan to diversify and become one of the 15 biggest economies in the world. 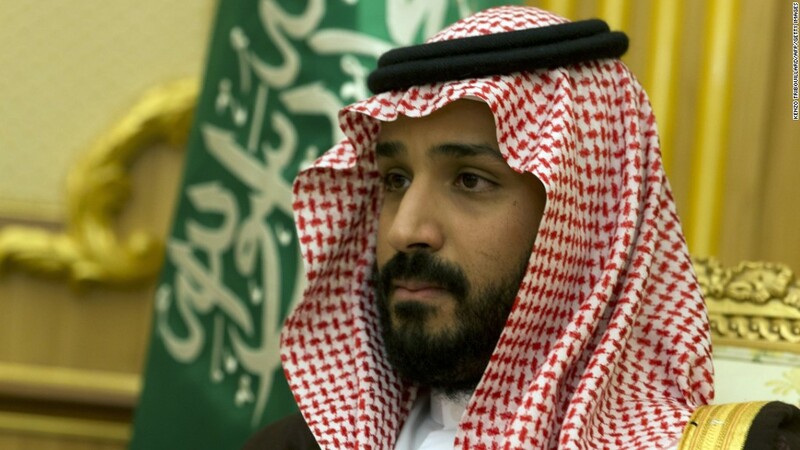 Presenting "Saudi Arabia's vision for 2030," deputy crown prince Mohammed bin Salman said the kingdom's huge oil wealth was now holding the country back. "We have a state of addiction in the Saudi Arabian kingdom, by everyone, and that's dangerous. That is what held up many sectors from developing in the past years," he told Al Arabiya television in an interview. Under his plan, Saudi Arabia wants to boost non oil revenues sixfold to $266 billion by 2030, sell part of national oil company Aramco on the stock market, and create a $1.9 trillion public fund to invest at home and abroad. Oil makes up 87% of Saudi Arabia's revenues and the collapse in world crude prices since 2014 has left the kingdom struggling. It has already cut subsidies and borrowed billions to try to balance its books. Saudi Arabian oil is among the cheapest in the world, costing just under $10 per barrel to produce. 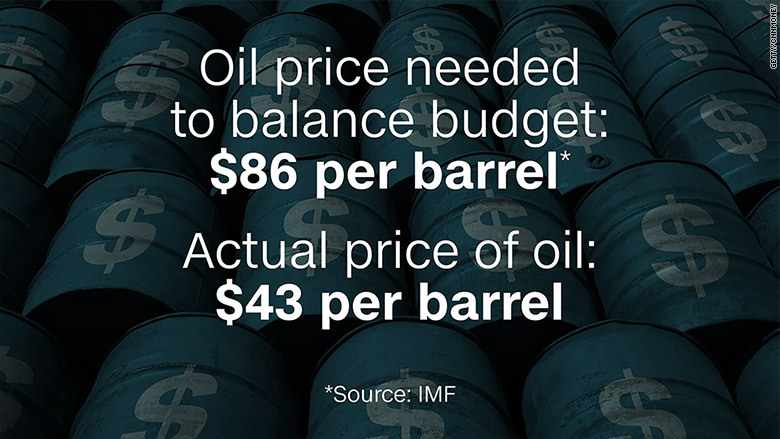 But the kingdom needs to sell it for about $86 per barrel -- or double the current world market price -- to keep its budget balanced, according to International Monetary Fund estimates. The IMF expects GDP growth to slow to 1.2% in 2016 from 3.4% last year, and it has warned that without a major overhaul, the kingdom will run out of cash in less than five years. The vision for 2030 aims to give a much greater role to the private sector, boosting its share of the economy to 65% from 40%. 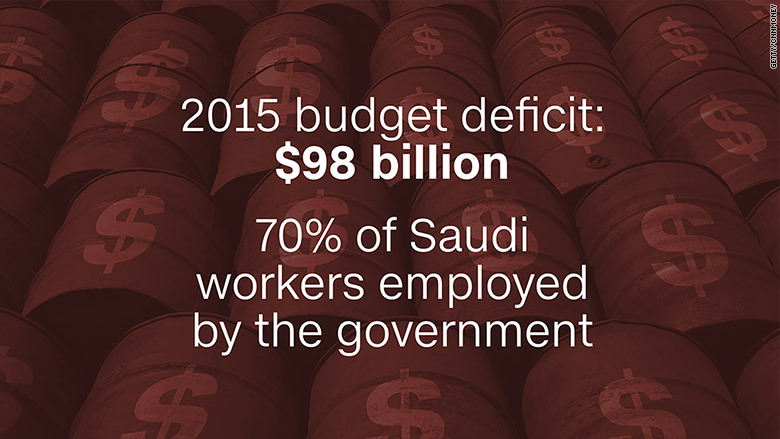 The majority of Saudi nationals -- about 70% -- are currently employed by the government. They earn 1.7 times more than their counterparts in the private sector, according to data from Saudi labor market surveys. The private sector is dominated by foreign workers who are not entitled to the same benefits as Saudi-born workers. The government now wants to encourage more Saudi nationals to work for private companies. It plans to use its sovereign wealth fund to help develop local manufacturing, technology, tourism and mining industries. It also wants to buy many more arms from Saudi companies, slashing the proportion of military equipment spending that goes abroad to less than 50%. All this should help tackle a growing youth unemployment problem. Roughly half of its population is under 25 and the public sector cannot keep creating jobs at the pace required to secure enough jobs for them. According to the plan, unemployment should fall to 7% in 2030 from 11.6%. Saudi Arabia has already announced an array of spending cuts. It slashed subsidies on water and energy, and cut its foreign scholarship program. The new plan also outlines the kingdom's vision to boost tourism. It wants to attract 30 million pilgrims a year by 2030, up from 8 million. -- John Defterios and Alireza Hajihosseini contributed to this article.